Are you ready for the A Number and Talent Contest season? "The Grange is a place where one can get a feeling of family, community and patriotism. Where a member in need can be helped and where you can feel the satisfaction of helping those in need. It is a place where you can enjoy interesting conversation and camaraderie." *Please note - there is a mistake in the Bluebook. This years' essay can be up to 100 words. The title this year is "The Grange in Our Community". Why not get a head start before the weather turns nice. Write your essay today. I hope everyone is getting ready for the "A Number" and Talent Contests. The only change from past years is that those who competed on the Northeast level have to skip a year before entering the contest again. 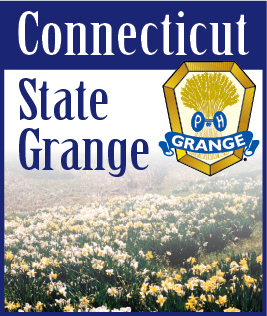 The State contests will be judged at Grange Sunday at Good Will Grange Hall in Glastonbury on June 13th. More to come on this later, but please mark your calendar. Also, please mark Saturday, July 24th on your calendar. "Let's Celebrate will have a new format and will be held at Cheshire Grange where there will be more room for our displays. We will have lots to celebrate on that date. The Mardi Gras will be coming to Connecticut that day with fun for everyone. Add to this the display of CWA articles, the Lecturers Photo and other committee contests along with a delicious dinner served by the Junior Department and you have a great event. Plan ahead. Invite your family and friends to come with you and show them what the Grange is all about.